The first time I had visited S's family when we were getting engaged my MIL had asked my father what would he like her to cook. My dad very gladly had said Bissi bele bhaath. During his short stint in Bangalore he had started liking Bissibele Bhaath , Pesarattu, Vaangi Bhaath and many more... So for him it was like a wish come true . And the bhaath was superb. So when I got married I grabbed the first opportunity that I got to learn the recipe. Bissi bele bath looks perfect dear! what a gorgeous color! 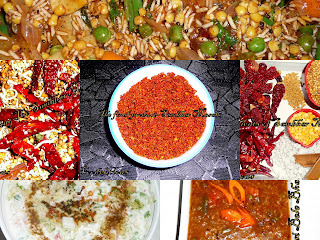 Wow.. looks delicious and spicy... lovely color.. nice clicks!! Love the color of Bissi Bele bhaath. Looks delicious! OH WOW FIRST TIME HERE ...loved ur yummy recipe collection BBB is looking so yummm.. wish to have some. Keep rocking will be back ..Like ur header picture too.. This looks so masala rich rice..! Yummy! Thanks a ton all of you. Oh this looks very colourful and delish - yum! Wow, Bissi bela baath, i always wanted to try to make it, Your recipe looks so rich, colorful and yummy, i cant resist myself, i will surely give it a try this weekend. You are doing a great job with the blog. All the best. Hi. Great recipe for the unbeatable kannada bisi bele baath! Try the BBB without peeling the potato, add a tomato to the veggies and do all the sauteeing, frying etc., of veggies in ghee and a higher measure of tuvar daal - roughtly in equal proportion to the rice... Cooking not really my forte, but BBB being my favourite, couldn't resist suggesting what I've tried! By any chance, you have the recipe for raagi mudde?